The sham veneer of democracy that is the “European Parliament” adopted a resolution today recognising the opposition leader Juan Guaidó as the “interim president” of Venezuela. It also called on member-states to recognise the coup government, just as it did with coup junta in Ukraine in 2014. The mask continues to slip and to reveal the true character and nature of the European Union, little more than an instrument for protecting and advancing the interests of big European corporations and global imperialism. It behoves all those parties and organisations, both here in Ireland and within the EU member-states, that still harbour illusions that this instrument of imperialism can be reformed or “democratised” to recognise these facts. By presenting such illusions they are complicit in the actions of the EU and now in particular in what is being organised for the overthrow of the progressive government of Venezuela and in the great suffering now being endured by working people and farmers in that country. 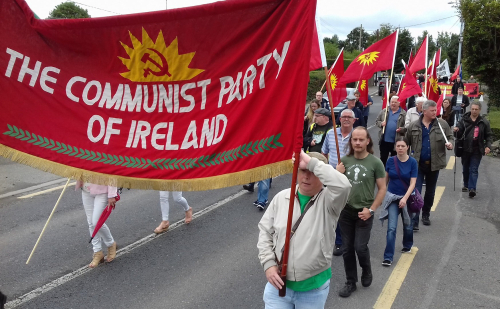 The Communist Party of Ireland calls upon workers’ organisations and democratic opinion to become involved in solidarity with the working people of Venezuela and to oppose the plans for a coup by the United States and the EU. We call upon working people to lobby the Government not to recognise this coup against the democratic government of Venezuela, headed by Nicolás Maduro. • Contact your local TDs and ask them to raise it in the Dáil. • Get your trade union, locally and nationally, to issue a statement of protest and of solidarity with the workers and people of Venezuela. • Send a message to Simon Coveney, minister for foreign affairs (simon.coveney@oireachtas.ie).